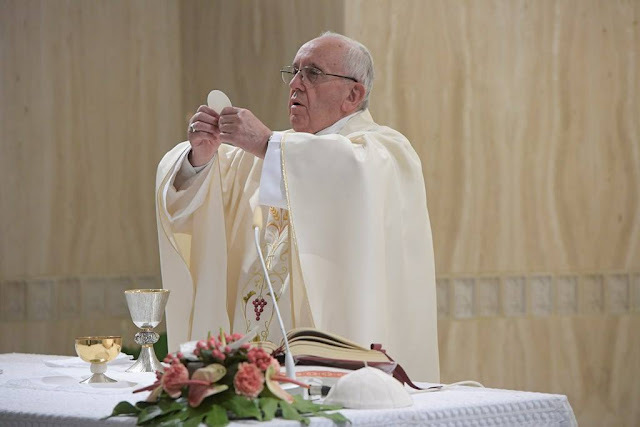 On Tuesday morning at Casa Santa Marta, Pope Francis reflects on the readings of the day and the central role of the Holy Spirit in the disciple’s life. Pope Francis, speaking about the close-mindedness of the doctors of the Law in the Gospel of John (10:22-30), explained how their observance of the law became rigidity. Since they placed themselves at the center, they remained untouched before the works the Holy Spirit accomplishes. Pope Francis highlights their inability to “discern the signs of the times” as a type of prison: They received a law that was life, but they “distilled” it, they transformed it into an ideology and thus they toss and turn it and are unable to move beyond. Anything new for them is a threat. Pope Francis continued by saying that there are two contrary ways to describe a person’s reaction to the breath of the Holy Spirit: closure or openness. It is openness which characterizes the disciples and the apostles, Pope Francis said. Before the fact that there will always be resistance to the Holy Spirit in the Church, the Pope concluded with this prayer: May the Lord grant us the grace of knowing how to resist that which we must resist, that which comes from the evil one, that deprives us of our freedom. May we know how to open ourselves to new things, but only those that come from God. May he grant us, with the strength of the Holy Spirit, the grace to discern the signs of the times in order to make the decisions that we need to make in that moment.